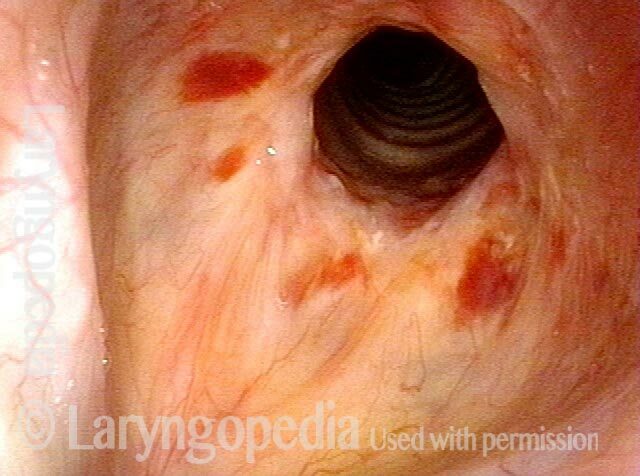 An incomplete or frustrated form (forme fruste) of Wegener’s granulomatosis, which we believe to be the cause behind some cases of inflammatory subglottic or tracheal stenosis. 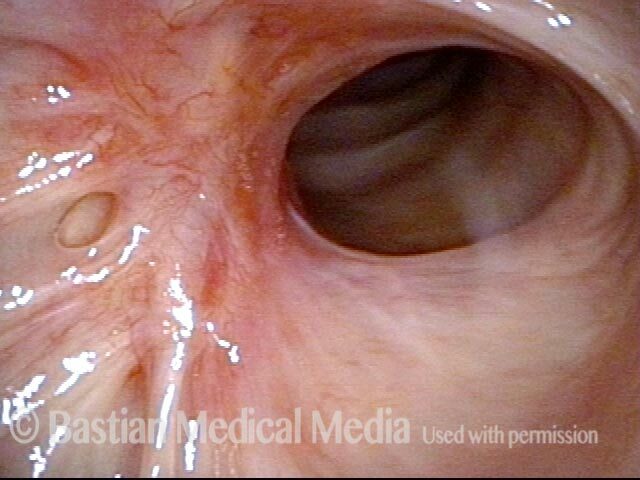 Unlike full-fledged Wegener’s, this forme fruste variant may or may not necessarily involve the sinus and nasal cavities, and in the author’s caseload of about 60 patients, it has not ever progressed to involve the lungs and kidneys. 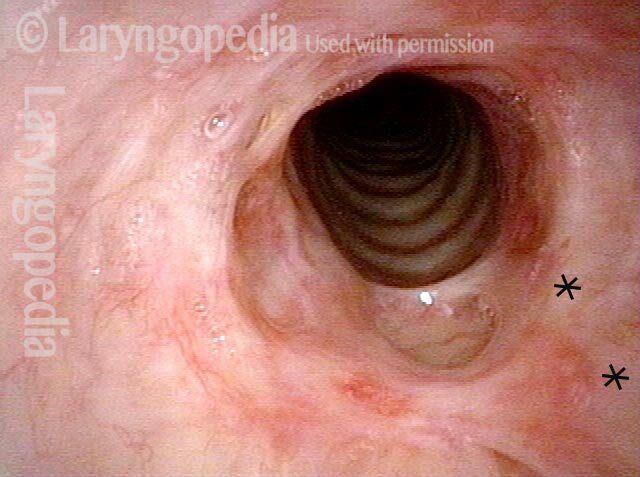 Such patients can go for years with only the need for intermittent dilation of the subglottic or tracheal narrowing. This disorder may be the same as what some call “idiopathic subglottic stenosis,” for which some have recommended cricotracheal resection and reanastomosis as treatment. Closer view, showing the clearly demarcated (dotted line) area of inflammation and narrowing. 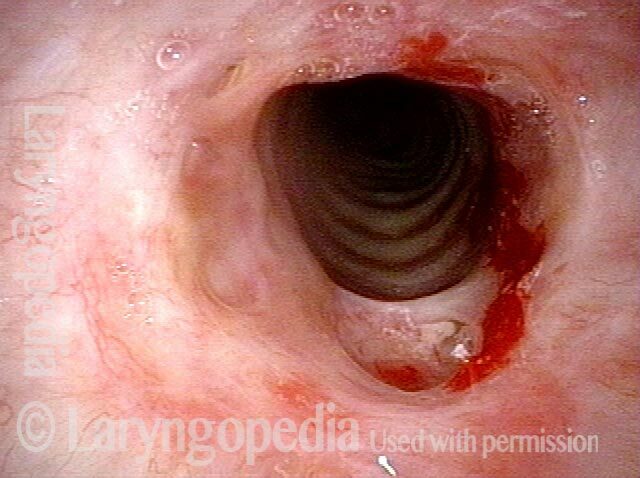 Normal tracheal rings are seen in the shadow, below the stenosis. Negative ANCA notwithstanding, we believe this is a forme fruste of Wegener’s granulomatosis. As is often the case in persons with inflammatory subglottic stenosis of unknown cause, there are some signs of inflammation in the nose, too, usually on the septum, denoted here with “S.” Right side of the septum is subtly abnormal. Here, under narrow-band (blue) light, the mottled, inflammatory appearance of the right side of the septum (S) is more clearly seen. 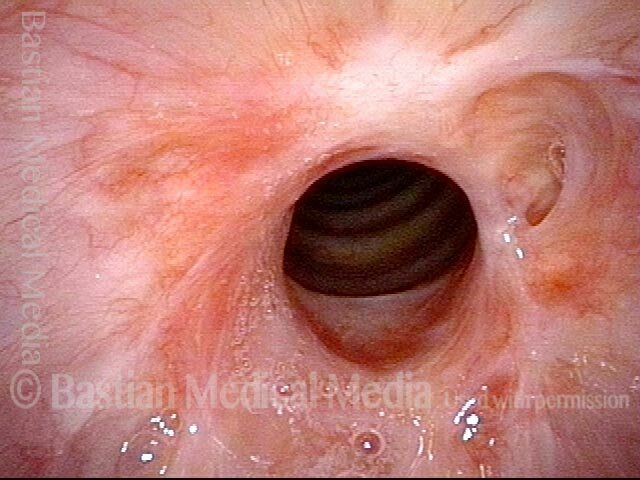 High-grade subglottic stenosis in a woman diagnosed syndromically with forme fruste Wegener's granulomatosis-related subglottic stenosis. With a narrowing less than 50%, she is very symptomatic. Her breathing is noisy, and her forced inspiration time is about 3 seconds. Compare with photo 4. Closer visualization reveals the inflammatory nature of the stenosis. Here the distal chip flexible scope has passed through the narrowing not only to see into distal trachea, but also as a breathing test. 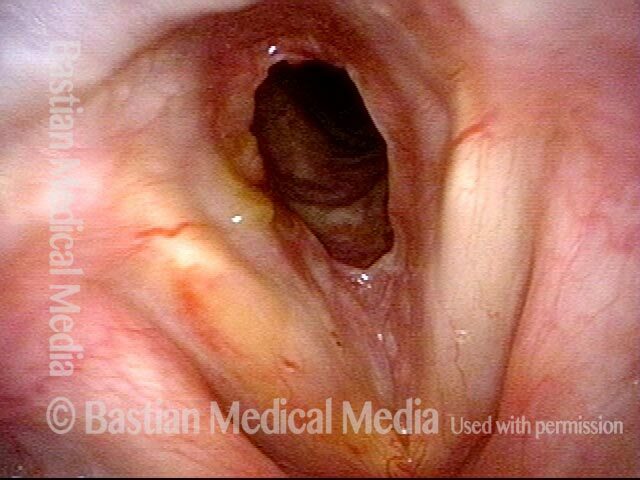 The patient becomes very aware of reduced space and this indicates a marginal airway. A week after dilation, triamcinolone injection and mitomycin C application, the patient says breathing is now normal, and forced inspiration time is only a second in duration--normal. Compare with photo 1. Closer visualization with early postoperative bruising. The trachea is now easily visible through the larger opening. Compare with photo 2. Three months after successful dilation, the patient says breathing is still normal. We are planning an injection of triamcinolone every 3 or 4 months, attempting to lengthen the interval between dilation procedures. Please note that the *s (right of photo) are for comparison with photo 2. 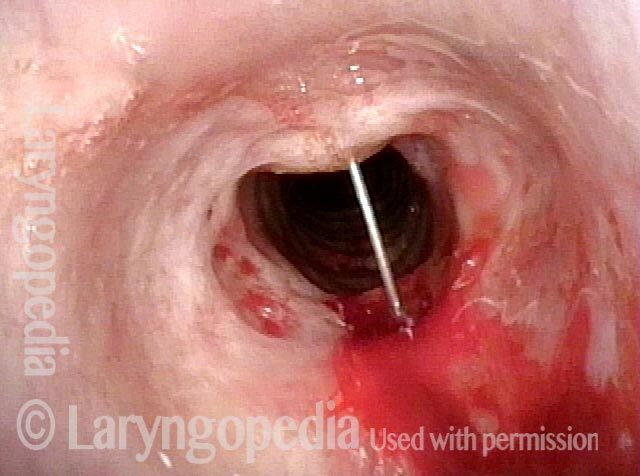 A needle has been passed into the anterior neck to place submucosal long-acting steroid. Note the bulging and blanching at the *s and compare with photo 1. 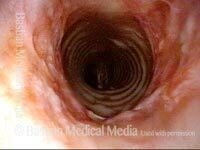 Here the needle has been passed translumenally and into the posterior portion of the stenosis. 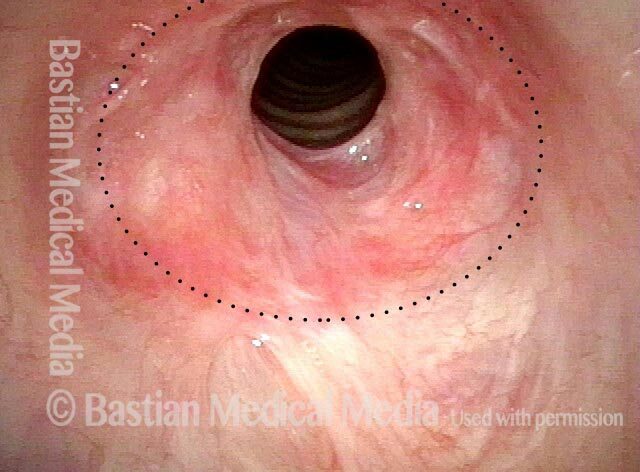 The posterior tracheal wall has flattened as compared with photo 3, due to the infiltrated medication. 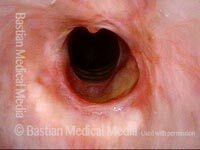 Under narrow band light, the unusual vascular pattern of both septum and turbinate becomes much more obvious. In this distant view, his subglottic stenosis looks just like the many other examples in Laryngopedia of forme fruste Wegnener's. The stenosis seen with both entities are visually indistinguishable. 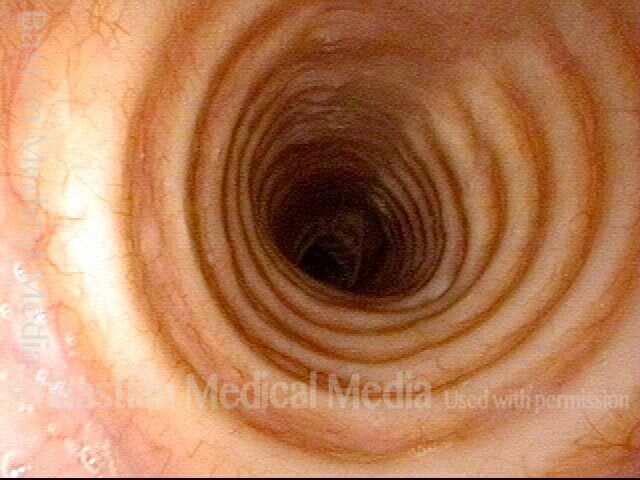 A closer view of the stenosis reveals more clearly the adherent mucus that is so difficult for such patients to cough out due to the “speed bump” interruption of the mucociliary blanket at the stenosis. 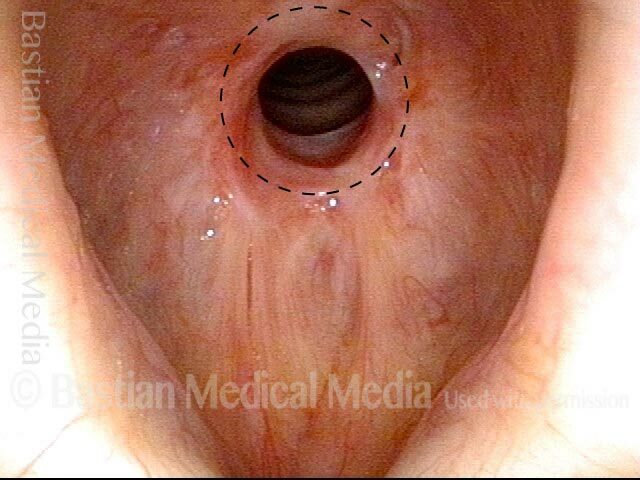 The usual method of dripping topical anesthesia into larynx, subglottis, and trachea from above through an Abraham cannula is difficult due to a powerful gag reflex. 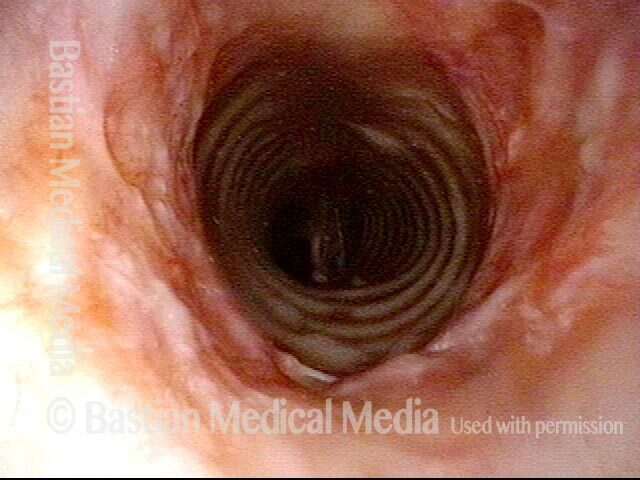 Here, the tip of a short 25 gauge needle has entered through the cricothyroid membrane, just below the anterior commissure. 2% lidocaine has just begun to squirt through the needle with the patient inhaling. Half a second later, the topical anesthetic is splattering (see streaks) and as the patient coughs. This will fully anesthetize the area topically. The topical anesthesia established by this method now allows injection of kenalog (see white submucosal bulge) into the posterior tracheal wall as a means of managing this patient’s subglottic stenosis likely due to forme fruste Wegener’s granulomatosis. Wegener’s granulomatosis is a rare autoimmune disorder in which blood vessels become inflamed. The inflammation causes swelling and scarring. Three typical organs attacked are sinus/nasal cavities, lungs, and kidneys. In the forme fruste variant, it is mostly an inflammatory stenosis (narrowing) of the area below the vocal cords, and also the trachea. A person becomes short of breath and begins to make harsh breathing sounds due to the narrowed passageway. This is an example of one means of management: dilation of the narrowed area during a very brief general anesthetic in an outpatient operating room. 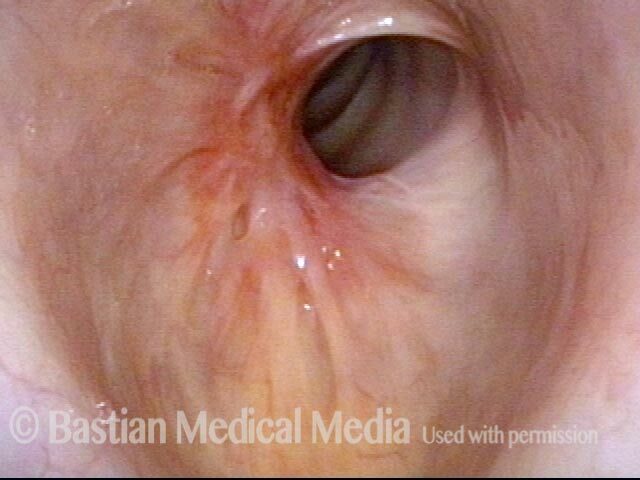 This entry was posted in Multimedia Encyclopedia and tagged Airway disorders, Disorders, Photos, Videos by admin. Bookmark the permalink.